ROGUE FRAGMENTS of the Dead Sea Scrolls on display in a church in Florida? A display includes pieces of the Dead Sea Scrolls. The pastor of a prison outreach ministry recently visited a St. Petersburg church with what may be part of the most significant archaeological find for people of the Christian, Jewish and Islamic faiths. The Rev. Thom Miller of Special Visit Ministry exhibited a small collection of religious antiquities, including what he said were two fragments of the Dead Sea Scrolls, at the Suncoast Cathedral on Wednesday for a group of church members and the media. Miller said one of the fragments was anonymously donated to the ministry and the other was on loan from a group of physicians from New Jersey. He plans to return to the Suncoast Cathedral in October with another Dead Sea Scrolls fragment that is held by the Ashland Theological Seminary and a more extensive exhibit of religious artifacts. 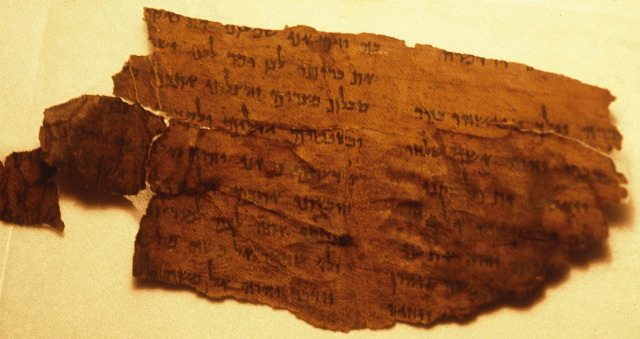 The Dead Sea Scrolls are actually a collection of more than 100,000 fragments that have been pieced together by archaeologists. The San Diego Natural History Museum is displaying Dead Sea Scrolls on loan from the Israeli Antiquities Authority, which holds most of the scrolls. Dr. Russell Fuller, a professor at the University of San Diego, worked as a consultant on the exhibit at the museum and edited a number of the Dead Sea Scrolls. He said bits of the artifacts have become privately owned over the years. "There are some small fragments in private hands in the U.S. and Europe, so it's conceivable that they could have a fragment," Fuller said. "If you have the resources and you have the contacts, it's possible that you could buy yourself a piece of Dead Sea Scroll." There's nothing about the content of the fragments, which makes me wonder if they aren't of the "burnt cornflake" variety that don't show any actual leather letters. Can any PaleoJudaica readers in Florida report on the fragments? TARGUM NEWS from Ed Cook over at Ralph. THE NEW TESTAMENT GATEWAY 2.0, BETA VERSION.